Diego and Angelo led a workshop as part of the KIBLIX Festival and the International Computer Arts Festival in Maribor, Slovenia, from November 18th to the 28th, 2010. The workshop resulted in an installation piece which will be exhibited at KIBLA until mid-December. artists articipating in the festival. An algae-cooled motherboard, just like in previous Biomodd mods. 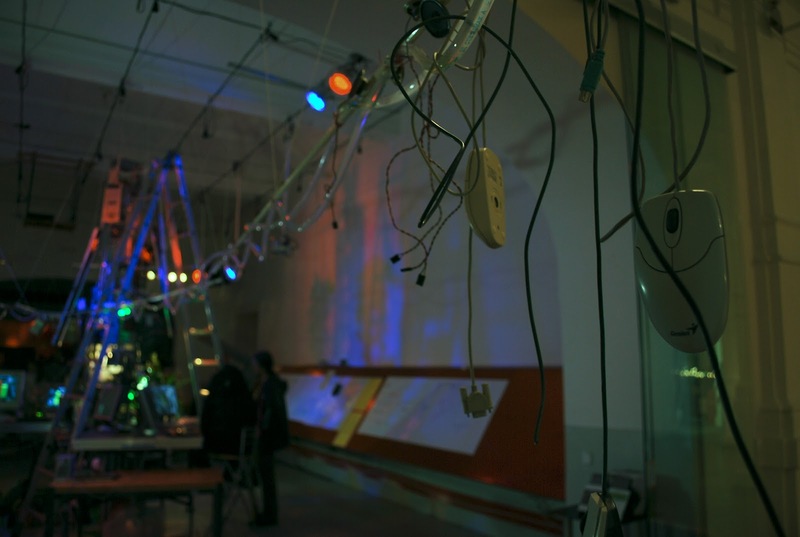 Unlike previous mods, however, the cooling tubes were suspended above the ground and extended for several meters, encroaching into a gallery space just next to the workshop space. 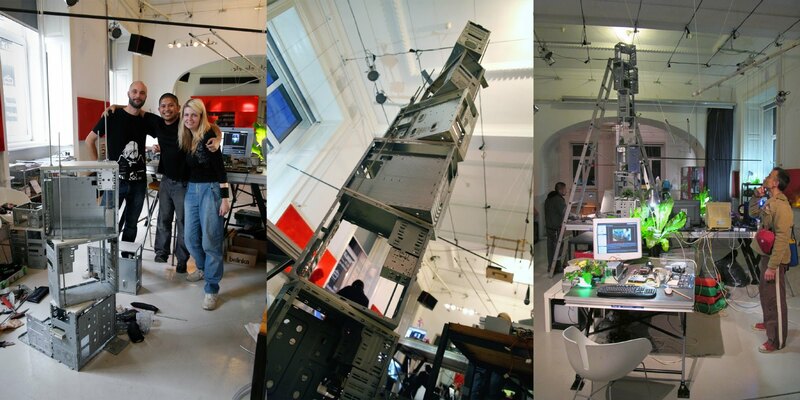 A tall tower of computer cases stacked in a spiral, with components mounted on the exterior, turning the interior into the exterior (which reminds me of the shower rack modds some of us did in Los Banos). All in all, we managed to get 7 computers running. Three were over ten years old but we managed to get Xubuntu running on them (which maybe we should have done in [LBA2]!). 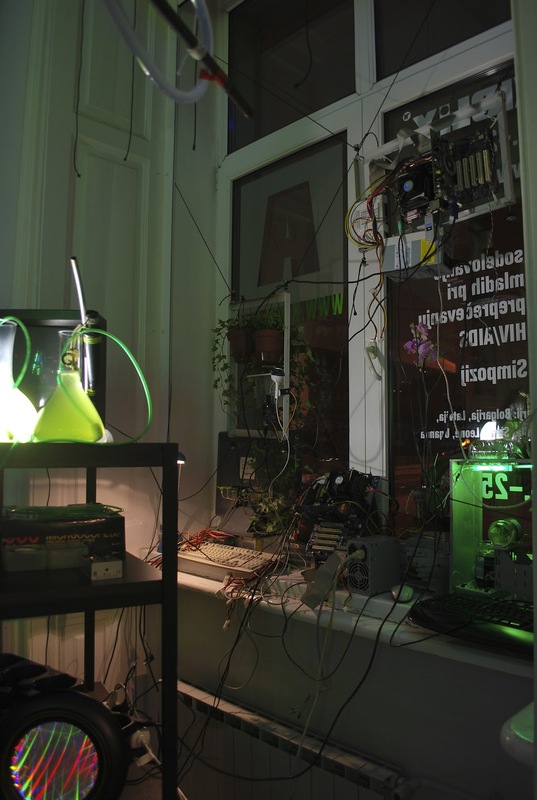 A satellite installation near a window that was composed of two computers, two webcams, a monitor, and a very large, old TV. One webcam captured video of the workshop space and sent it to the monitor, which was on the window and was facing the street. 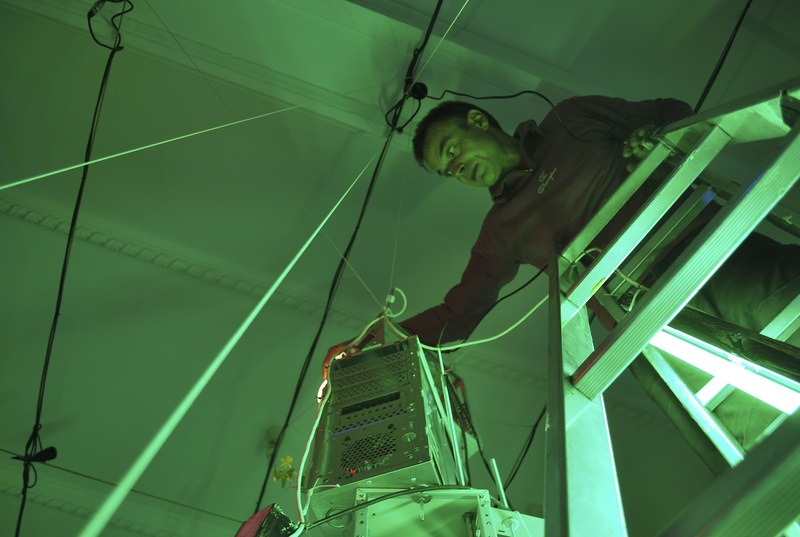 The other webcam scanned the window ledge in a sweeping motion, monitoring the plants and the computer components on the ledge, and sent the video to the TV, which was facing the workshop space. 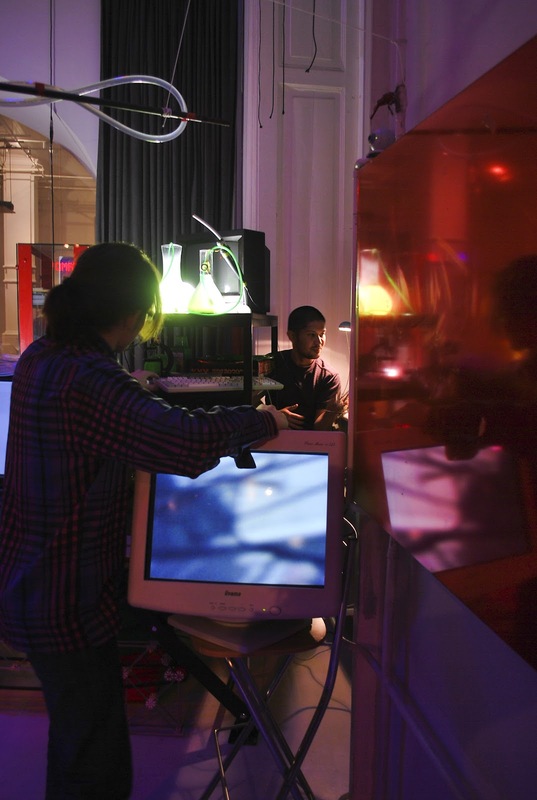 We also fed the sound of the aerating algae into the TV, giving Biomodd for the first time a sound. 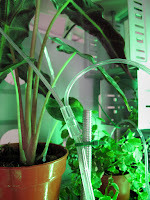 A system for watering plants at the top of the tower using syringes and IV drips. Very simple, but effective. 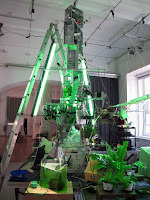 Angelo remarked on how these implements that normally give life to humans instead gave life to plants. 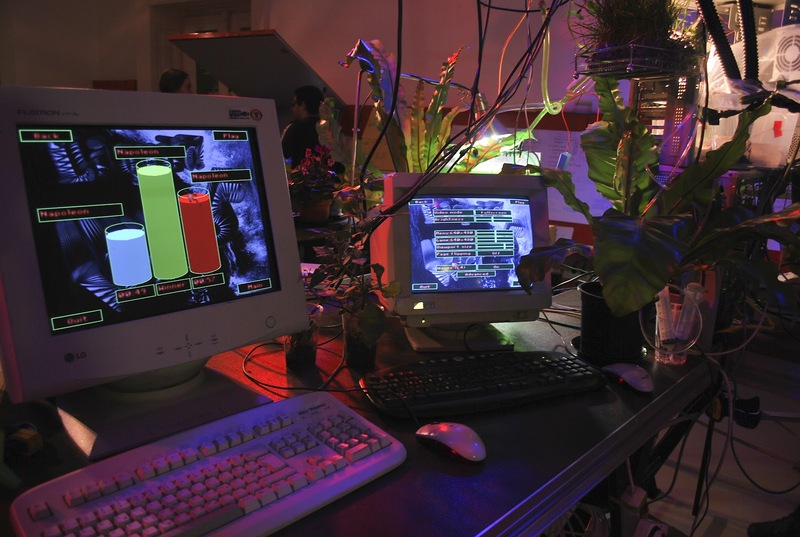 The game Liquid War (which was first used in a Biomodd context in the Sint-Niklaas workshop) was installed on all the computers integrated in the tower. 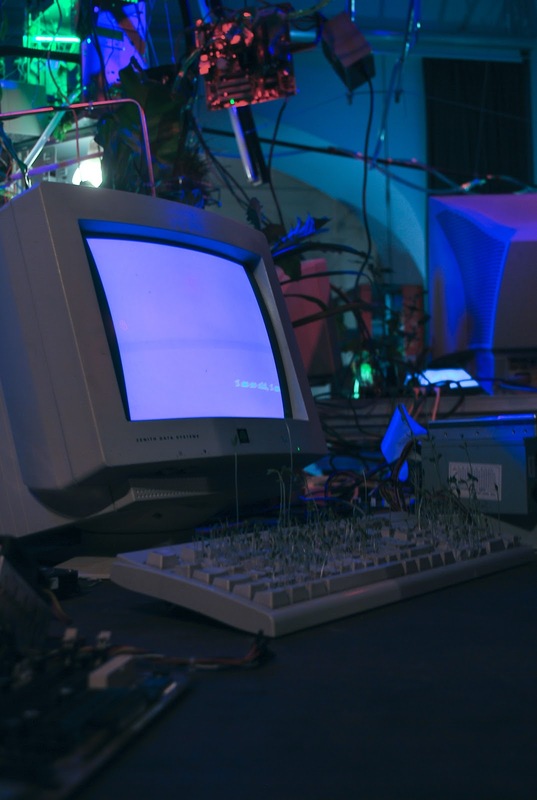 One last (and humorous) detail: a resurrected Windows 3.11 machine connected to a keyboard with seedlings growing on it. The screensaver reads, "I am so old, I am overrun by plants." Angelo traveled from Belgium with artist/rigger Nic Geeraert, who became the backbone of much of the larger-scale construction and rigging. We started off with two regular workshop participants from the art pedagogy program at the university in Maribor, Monika Pocrnjić and Maruša Novak; we ended with two more regular student participants, Simon Repnik and Špela Kobal. The work they put in was simply fantastic. They also helped us get the 3rd and 4th year students (led by their professor Dušan Zidar) of their program to contribute some of their time to the workshop, too. 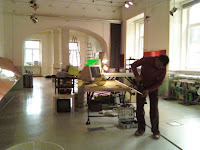 Simon Sedmak was KIBLA's technical person and helped sort out many of the kinks that we had with hardware. Miha Horvat of Fundacija Sonda coordinated a lot of the logistics that made the workshop run. 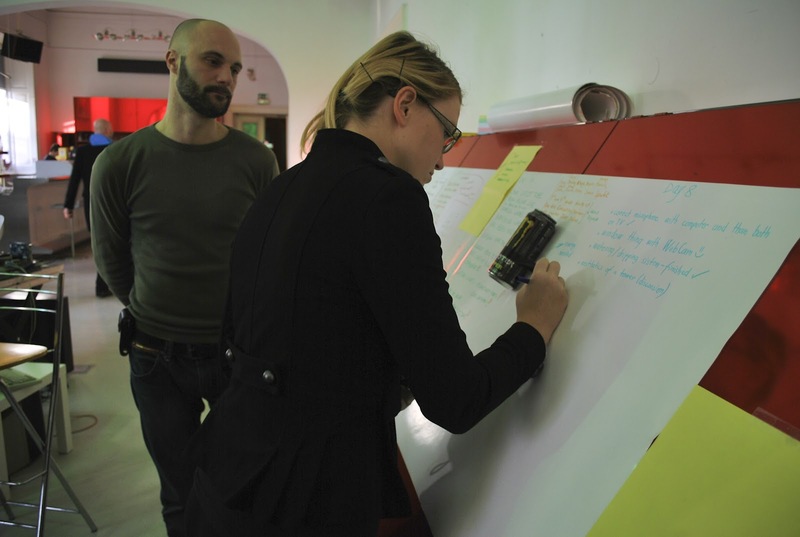 Finally, the workshop would not have been possible at all without the support of Aleksandra Kostic and Dejan Pestotnik. Our thanks also go to all the other staff of KIBLA, who did fabulous work in supporting our many needs (some of which included eating, drinking, and kicking back). 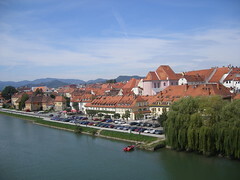 There are so many nice things and new experiences which have been learned in the last Biomodd Workshop in Maribor, Slovenia. Nicely connected technology and nature left a big impression, at least for me :) It was really an intensive 10 days workshop, and I felt really bad for those days which I could not participate. In the beginning I had NO idea about software and hardware. Nothing! But on the first day, we made a lot of computers working, installed Ubuntu and learned how to interact technology and nature. And in following days it was like everything was going so fast and we were productive. At the end, I am (still) very happy for the things we did. Also because it was an nice exchange of... everything! And before I forget - I think we were a great working group, I learned a loooooot from you, guys! And everything went really dynamic also because of that. Now, I am environmentally aware as never ever before. And this is a good thing, I suppose. 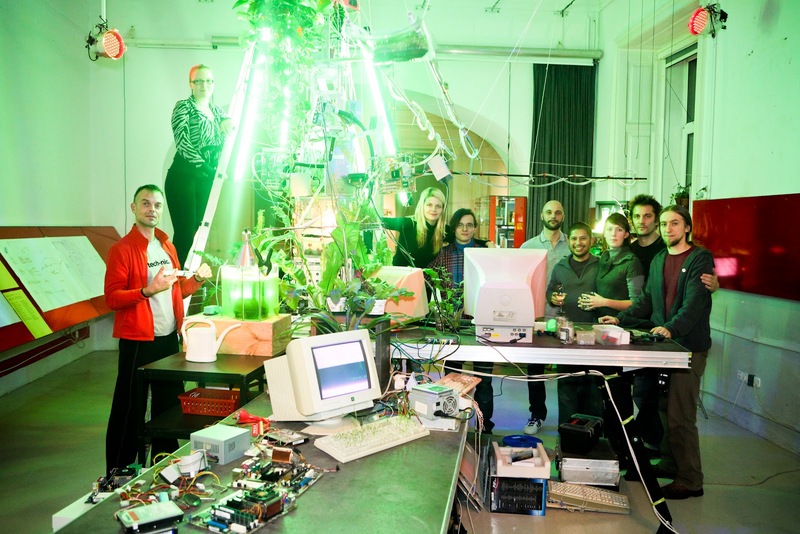 Impression of Biomodd is still alive in Maribor. 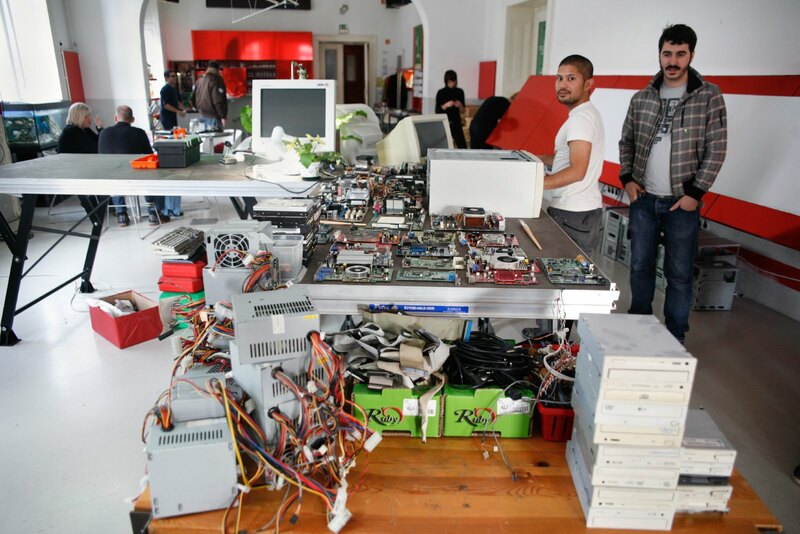 When I return to Kibla (our workshop place) I am always happy when I see some plants and computer components lying somewhere... I know that they are still breathing. It was great to work with Angelo, Diego, Nic and the rest of the beloving team; Monika, Spela and Simon. 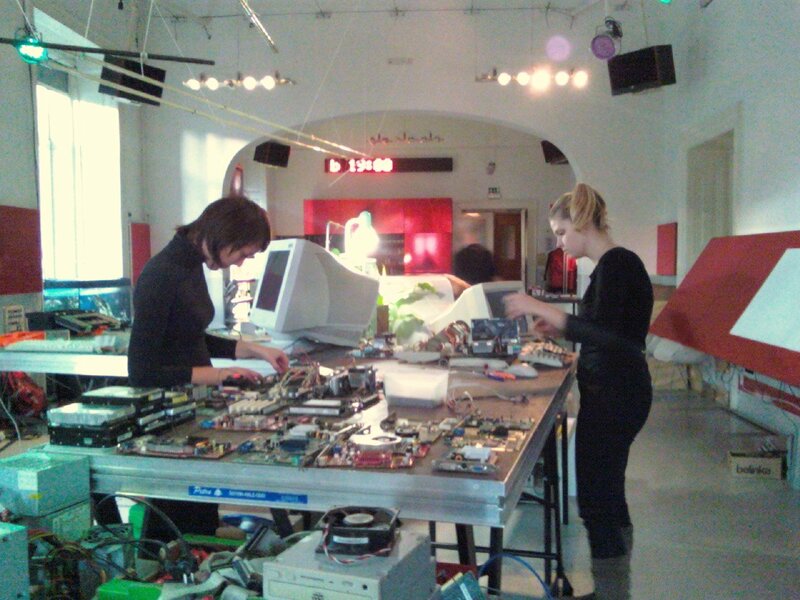 Today Nic and Monica have begun the construction of a large tower built out of the metal cases of the computers that were disassembled during the first few days of the workshop. 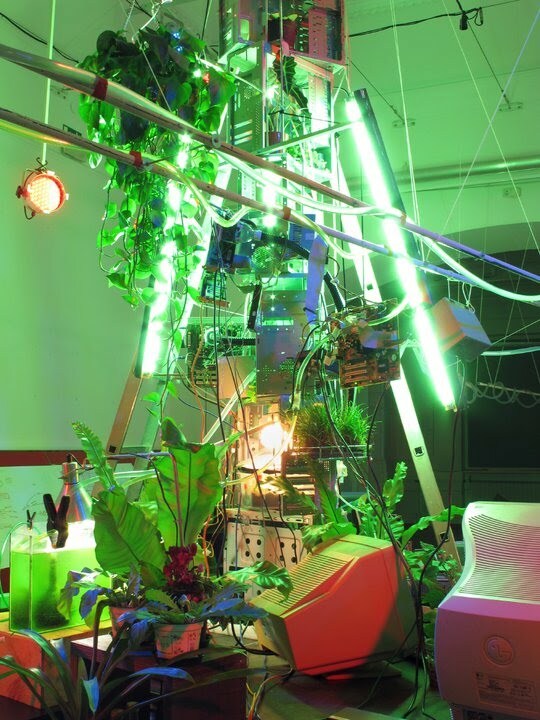 The goal is to create a 4m tall structure that hovers over the entire installation. Each case is positioned on the underlying case in 30 degree angle resulting in a spiraling vertical structure. 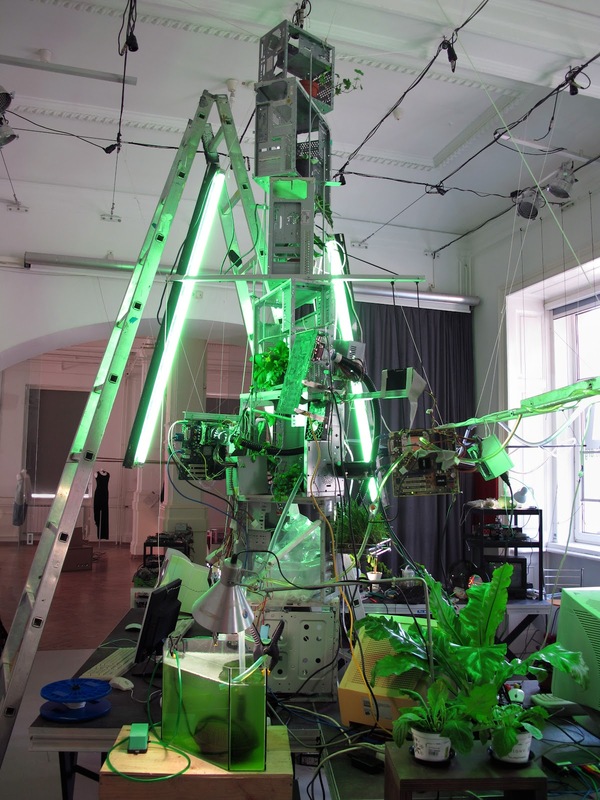 The tower will house reconfigured computers and plant life, and will serve as a supporting structure for an algae circulation system. This circulation system is planned to run through a large part of the space. 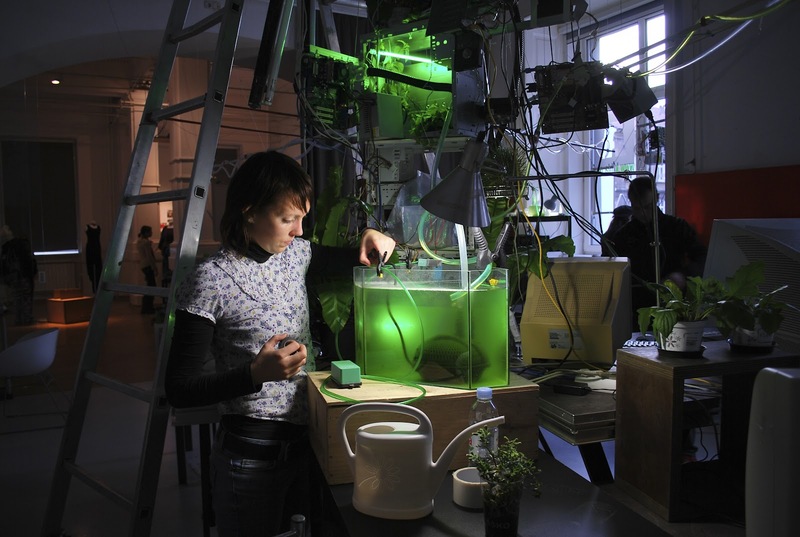 The algae that are currently being cultured in Kibla have been in use for a diversity of international art projects since 2002, and are essentially a mix of Belgian, American, Filipino and Slovenian variants of the ubiquitous Chlorella species. They are silent witnesses and represent the accumulation of past experiences with different communities throughout the world. The tower has now been placed in its final position. The next steps are determining where and how to include computer units, and how to integrate plant life, algae, and case modding lighting. We've run into a problem with a particular motherboard (Figure 1; click the images to enlarge). 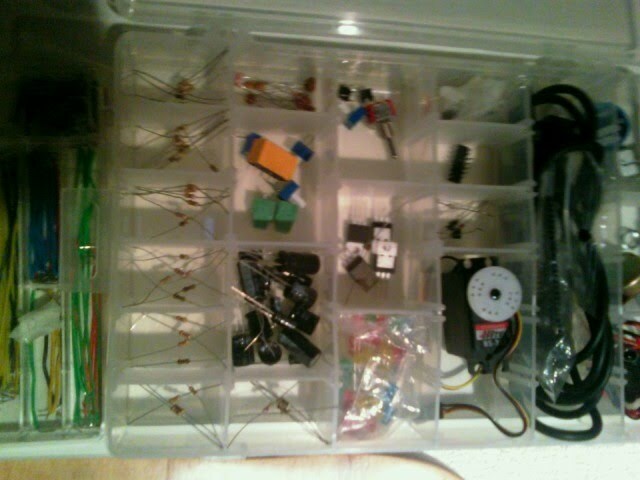 We can't figure out how to power it on because the pins aren't labeled. It's a Fujitsu motherboard, and we found two numbers etched onto the board, w26361 w57 x 03 and w57 z2 04 36. A Google search yielded little to nothing. We think maybe the power pins are on this set of pins labeled FRONT (Figure 2) but we tried every pair combination and the computer still refused to start. Update: Problem solved. We were completely wrong about the pins. They were located on a completely different part of the motherboard, though it took a few heads put together to piece the puzzle together! Totally excited to see and work with Angelo again, and in such a different context from [LBA2].